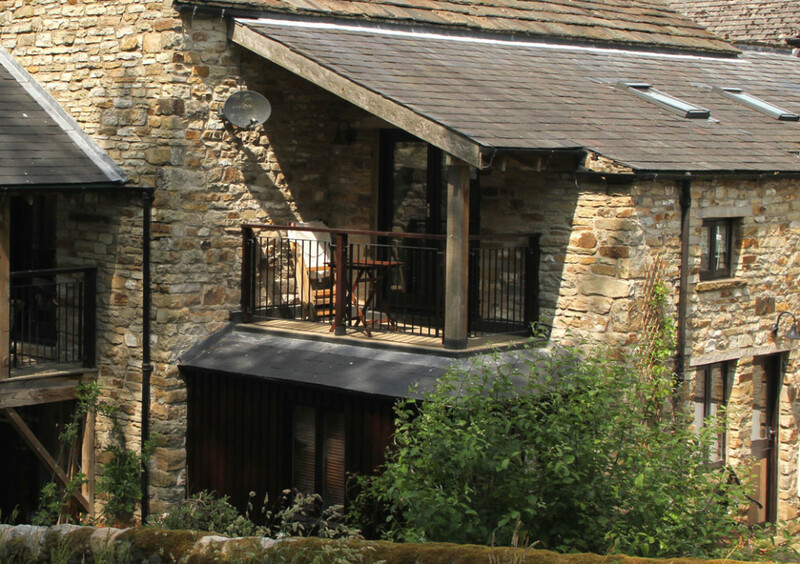 Naworth was the first of our properties to be developed and is a conversion of an old two storey stone lean-to building dating from the seventeen hundreds or possibly earlier. It gets its name from an inscription on a stone bearing the name of Lady Dorothy Howard of Naworth Castle which we found in the wall of what is now the kitchen. The living/dining area upstairs leads through French windows onto a balcony with a peaceful view of the church-yard, an ideal setting for being creative or simply relaxing and enjoying the fresh air. Ground floor: entrance hall. Well equipped dining kitchen. 1 bedroom with 2 single beds. Bathroom with shower over bath, WC and wash hand basin. First floor: sitting/dining room with solid oak floor, and French doors leading to covered decked balcony. 1 double bedroom with king size bed. Facilities: gas hob, grill and oven, microwave, 'retro-style' fridge-freezer, kettle, coffee machine, toaster. Automatic washer/dryer, iron/ironing board. Flat screen TV (with freesat), DVD, Hifi and free Wifi. Gas central heating and all electricity included. Bed linen and towels provided. Double sofa bed in living room for occasional extra guest or alternative sleeping arrangements. No smoking in the cottage please. Covered first floor balcony sitting area with table and chairs. Private parking for 1 car. 1 well behaved pet welcome. The bedrooms which are on the ground floor are traditionally furnished with iron bedsteads and Egyptian cotton bed-linen. An open staircase leads from the hall to the totally open plan, spacious living area upstairs. 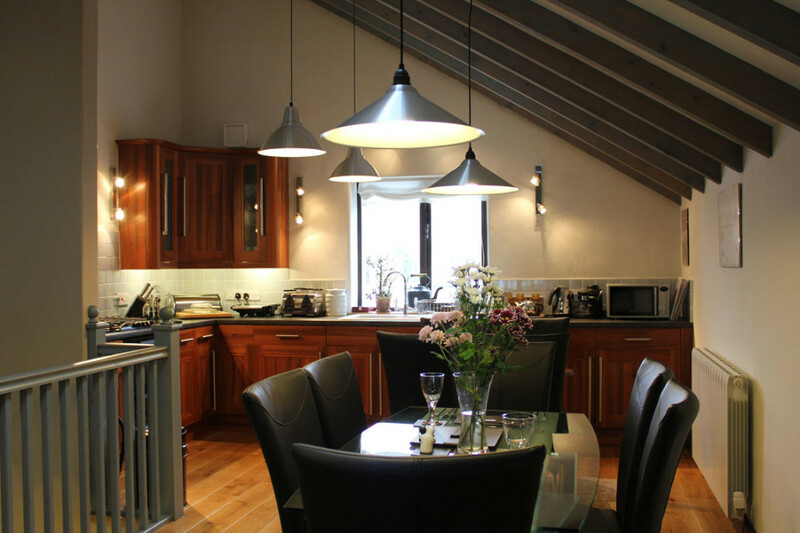 Here you will find a stylish well equipped kitchen, modern dining area, and a living room with French windows leading out onto a pleasant balcony with views towards the churchyard and the nearby fells….just the place to relax with glass in hand or grab a pencil and get creative. First floor: open plan sitting/dining room with waxed oak floor and French doors to covered decked balcony with views towards the fells. Well equipped kitchen area. Facilities: gas hob, double electric oven, microwave, fridge, freezer, kettle, espresso coffee machine, cafetiere, toaster, pannini press. Dishwasher. Automatic washer/dryer, iron/ironing board. Flat screen TV (with freesat), DVD, Hifi, free Wifi. Gas central heating and all electricity included. Bed linen and towels provided. No smoking in the cottage please. Covered decked first floor balcony. Decked sitting area. Private parking for 1 car. Sorry no pets. Millstream is one of our two new-build holiday cottages but it has historic origins, being built over the basements of a previous cottage, possibly dating back to Mediaeval times. These old basements were stepped, so Millstream now has a split level ground floor with interesting uneven walls and angled rooms. Another historic feature of The Butts, where our cottages are situated, is the old mill race which actually runs below our other three cottages. It emerges in an open “leat”, a stone built channel in the terrace just outside the French windows of the living room…..So Millstream is blessed with the relaxing sound of flowing water. This apartment has a light and airy feel with a large window area overlooking the patio and millrace…..it is a great place to relax and unwind and also to be creative. Ground floor: entrance hall. Well equipped dining kitchen. Cloakroom with WC and wash hand basin. 8 steps down to sitting room with French doors leading to paved patio where the narrow mill stream (which is covered) runs through the centre of the patio, (children must be supervised). First floor: 2 bedrooms – 1 double with super king size bed. 1 with 2 single beds. Bathroom with shower over bath, WC and wash hand basin. Facilities: gas hob, electric oven, microwave, fridge, freezer, kettle, coffee machine, toaster, sandwich maker. Automatic washer/dryer, iron/ironing board. Flat screen TV with DVD facility, Hifi and free Wifi. Gas central heating and all electricity included. Bed linen and towels provided. Shaver point. No smoking in the cottage please. Patio with table and chairs. (due to narrow stream flowing through children must be supervised). Private parking for 1 car. Sorry no pets. If you come by car, please don’t just stock up at your local supermarket before you come…support our local shops….You can buy most essential everyday needs in Alston. We have an extremely good bakers and wholefood shop, as well as two small supermarkets and a chemist should you need medicaments or toiletries. Less than five minutes walk from our cottages are the picturesque market square and cobbled main street, where you will also find traditional pubs with log fires, good food and real ale. Here we have the best of both worlds – pubs and shops around the corner but splendid open countryside less than 10 minutes walk away. 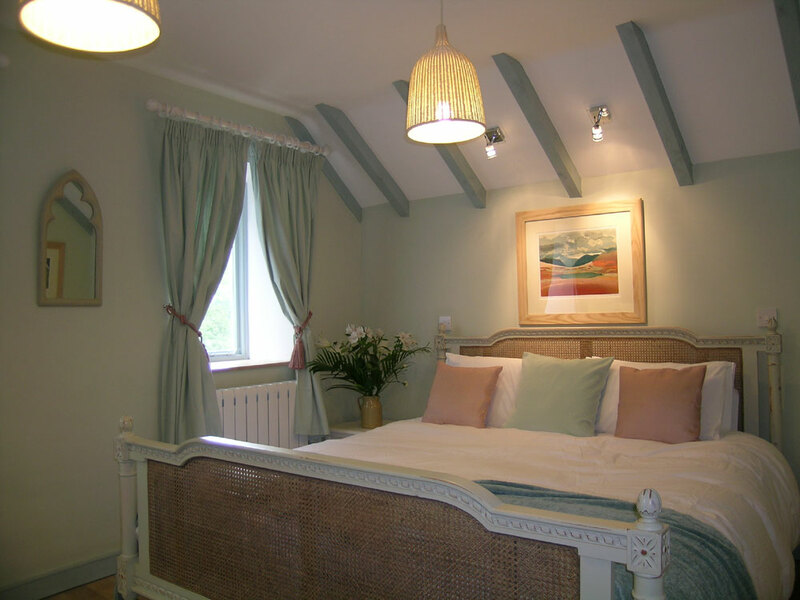 Our cottages are well insulated and heated by energy efficient gas boilers and we use low energy light bulbs to reduce energy consumption. You will also find that we operate a recycling policy in our cottages, so we ask you to sort your rubbish and put it in the containers provided. We take cans, bottles, hard and soft plastic, and paper and card to our nearest recycling centre. Transfers If you don’t have a car or are coming from overseas, or if you just want to get away from the pressures of modern life and leave your car behind, we may be able to collect you or arrange a taxi service from a variety of railway stations, depending where you are coming from. We can also collect overseas visitors from the international ferry terminal at North Shields (near Newcastle upon Tyne) or from Newcastle airport. Please contact us for further information if you require these services. We are currently awaiting grading under the Green Tourim business scheme.